I'm lazily posting another one of these, because it's fun and I am working on another couple posts slowly while I work on my seminar project for my upcoming field course. Hope you enjoy! Here's a recap: I've decided to start a new series of posts called "Just Because It's Pretty". These are products (from as usual, non-animal testing brands), that are especially lovely to gaze upon. Whether it's the pattern of the powder or the packaging! These are not reviews, but instead just products that are tempting due to looks alone. Tell me some of your favourite beauty items that you like to have out to decorate! Art Deco has made a beautifully designed intricate (both inside and out!) 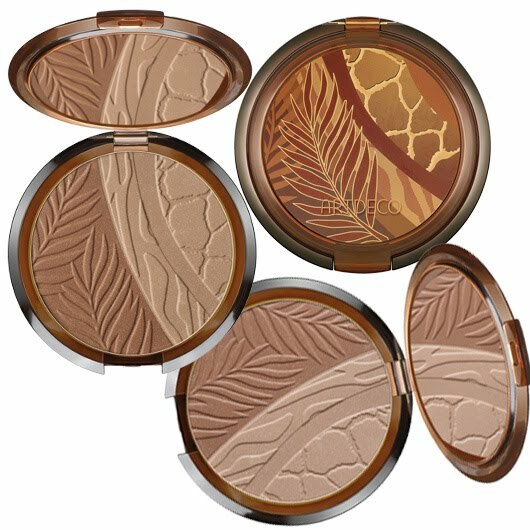 bronzing duo that comes in two shades. One shade is slightly cooler and the other warmer. I particularity adore how they combined two animal prints (giraffe and tiger) with some fern leaves to give a jungle sort of feel to it. This was released this year (and this season if I'm not mistaken) and also has a SPF of 15. It has a light matte finish. The powder also contains two special ingredients, the first "Inca oil" they describe as coming from nuts in the mountains of Peru (fancy dancy) which they state contain fatty acids that nourish the skin and also help it retain moisture. The second spiffy ingredient is extract of peas (really? Peas? If you say so.) which they say helps restore collagen structure in the skin. Honestly, I had no idea peas even contained Vitamin C which is what collagen is made out of. This compact is available for 19 Euros from the Art Deco website (and hard to get a hold of in North America). It really does look chic though doesn't it? What do you think?